Share the excitement of Costa Rica’s top two vacation destinations with your family or friends by discovering Arenal Volcano’s lush tropical rainforest and Manuel Antonio’s beautiful white sand beaches, both full of interesting wildlife. For adventure, you’ll hike the base of the volcano, have a choice of exploring the rainforest along hanging bridges or by the thrill of ziplining, then relax at a favorite eco-resort featuring onsite hot springs. 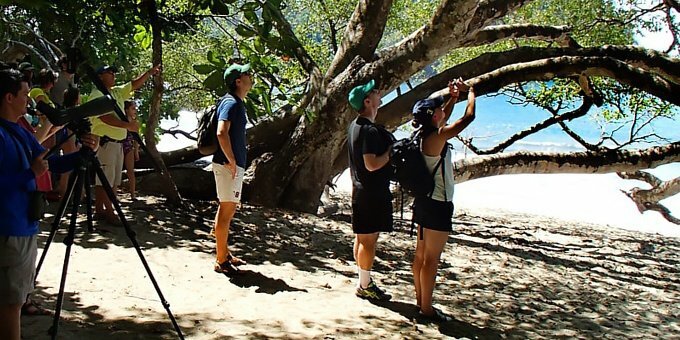 Over at the beach, you’ll go on a guided nature hike within popular Manuel Antonio National Park and stay at a luxury condo surrounded by jungle with spectacular sunsets. 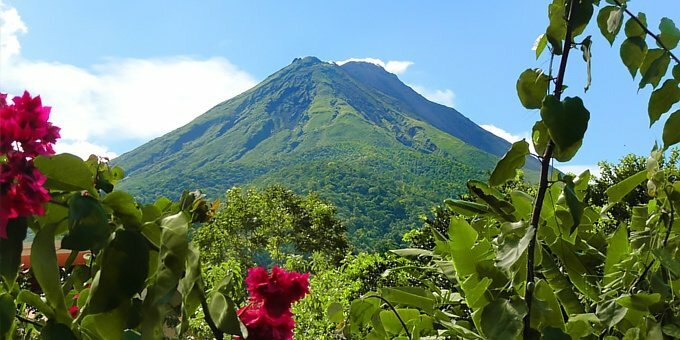 Hiking Arenal Volcano’s lush rainforest draped in vines, mosses, and orchids will have you searching for monkeys, toucans, and other exciting wildlife! Then you’ll travel to the small seaside village of Manuel Antonio to discover an area of beautiful tropical white sand beaches found along the central Pacific coast. In addition to the volcano hike, you can choose a bird’s eye view of the jungle canopy by walking over hanging bridges or soaring through the forest by zipline. A guided hike into the Manuel Antonio National Park will likely reveal a sloth or two plus prehistoric-looking lizards and so much more. All this in only 7 days! Perfect for a family vacation. Welcome to Costa Rica! As you touch down at the San Jose International Airport (SJO) you’ll receive a VIP greeting from a representative of Pacific Trade Winds who will provide transport to a beautiful eco-resort surrounded by tropical gardens directly across from the iconic Arenal Volcano. Located outside of the colorful, bustling town of La Fortuna, your resort includes onsite hot springs exclusively for its guests as well as a swimming pool, Jacuzzi, and variety of restaurants. Optional spa services are also available. An informative nature hike will take you on groomed trails through the rainforest along the base of the volcano. As you walk the floor of the giant forest, you’ll be surrounded by vines as you listen for tropical birds and animal life. Your guide will explain the area’s interesting history while pointing out visible wildlife that often includes monkeys, agoutis, and tropical birds, plus varieties of orchids and other interesting air plants. On another day you’ll have your choice of exploring the jungle canopy by walking across hanging suspension bridges or soaring by zipline over the treetops. OR, the high flying ziplining course provides 12 different cables of various lengths and heights ending with an awesome Tarzan Swing! Next, you’ll leave Costa Rica’s temperate interior and head over to the beach for some fun in the sun! The small village of Manuel Antonio on the Pacific Ocean welcomes visitors to its pristine palm circled coves with white sandy beaches washed in turquoise blue water. 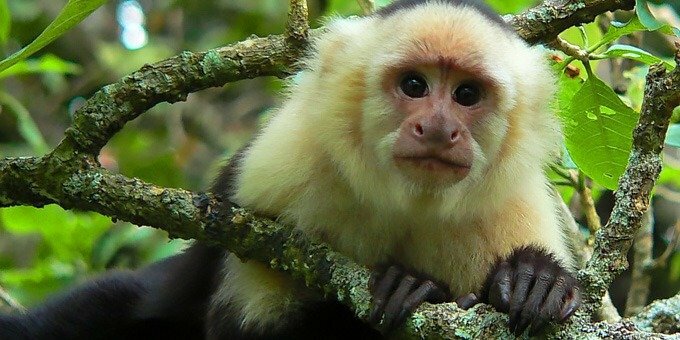 At Manuel Antonio National Park, the must-do guided hike along trails and boardwalks takes you in and out of various habitats specific to unusual wildlife such as sleeping sloths and crocodiles. No food is sold or allowed within the park so bring your water bottle to keep hydrated. You’ll end up at a beautiful cove where you can choose to swim while in the park, or you can explore one of the equally scenic nearby public beaches on your own. You’ll enjoy the luxury of a condominium stay with spacious rooms, full kitchen, and sweeping views from your patio. The chef at the onsite restaurant, open for all meals, prepares both traditional and international dishes with a flair. The covered outdoor seating, surrounded by tropical foliage and overlooking the ocean, offers spectacular sunsets. Many other amenities include an infinity pool, Jacuzzis, and shuttle service to a nearby secluded beach. 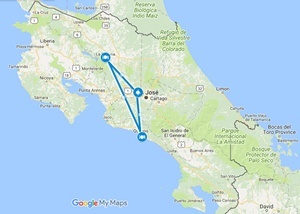 The weeklong Rainforest Volcano and Beaches vacation invites you to experience the amazing diversity of Costa Rica’s outdoor majesty and ends with an effortless private transport back to the airport on the day of your departure. Once you arrive at the San Jose International Airport (SJO), a representative will greet you and provide transport to Arenal Springs Resort and Spa, located across from Arenal Volcano just outside the town of La Fortuna. Relax and enjoy the onsite hot springs! You’ll be picked up and taken on a professionally guided hike around the base of Arenal Volcano. Your naturalist guide will point out areas of interest and identify the day’s visible wildlife. 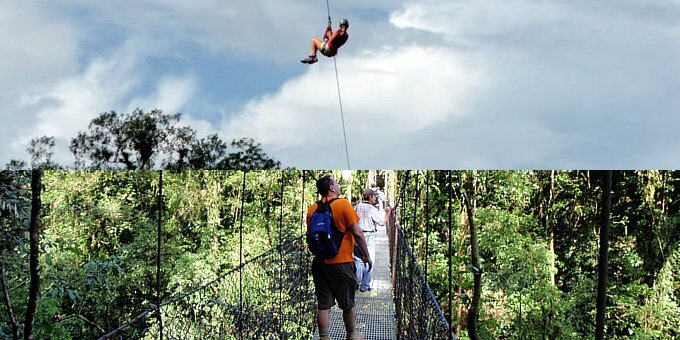 Today you’ll have a choice of exploring the lush rainforest canopy either by Hanging Bridges OR a Zipline adventure. The Hanging Bridges tour will take you on a leisurely guided hike over the tree canopy across suspension bridges. The Zipline adventure will have you zooming over the treetops along 12 different cables stopping at strategically placed platforms. A transport will take you to the coastal village of Manuel Antonio where you’ll be staying in a condominium at the Los Altos Resort overlooking the Pacific Ocean. Today is yours to spend any way you like. You may want to relax at the resort pool and Jacuzzis, take the shuttle down to the beach and use the lounge chairs, or do a spa day. If you like, you can even add an additional tour as your itinerary is fully customizable. Transportation will be provided to deliver you back to the San Jose International Airport three hours before your scheduled flight time. Buen Viaje! A) The HANGING BRIDGES tour provides an amazing opportunity to walk at different levels while exploring the rainforest canopy. The leisurely guided hike begins along terrestrial trails and continues up into the tree canopy where you’ll walk over suspended bridges to look down into the lush jungle below. Bilingual guides will share their knowledge of the forest with you, pointing out areas of interest and identifying visible wildlife. B) The CANOPY ZIPLINE offers an exciting adventure for anyone seeking a full-on adrenaline rush! Your professional guides will lead you into the forest canopy where you’ll zoom over 12 different zipline cables landing on platforms all along the way. At the end, you can channel your inner kid as you fly through the trees on the Tarzan Swing. Low Season 2018 rates start at $1,049 USD* per person double occupancy, $877 USD* pp for triple occupancy, or $1,939 USD* pp for single occupancy for the lodges listed above. High season 2019 rates start at $1,408 USD* per person double occupancy, $1,201 USD* pp for triple occupancy, or $2,662 USD* pp for single occupancy for the same lodges. Low Season 2019 rates start at $1,315 USD* per person double occupancy, $1,119 USD* pp for triple occupancy, or $2,477 USD* pp for single occupancy for the same lodges. You can upgrade or downgrade hotels to match your preferences and budget.